Putting in extra time in the pools after a group swim practice. Effortless swimming takes effort. I know, I have been working at it for over 16 years since I became a Total Immersion coach. Elbow grease. Practice. Learning takes effort through practice. Repetition. Repetitive focus on a skill. The mind knows what it wants, for example, bring the hand forward, but it takes time for the feedback loop to know it, to feel it. To feel it, the mind and the body need practice together, synchronizing. Repetition with intention and attention, and a certain amount of curiosity. You want to know the hand is coming forward because you can feel it, then be curious what the result is. When people come to me for a lesson I preface it by saying they will get information on how to practice, but they will not be cured or healed of their swimming woes by the end. The lesson is just the beginning. Our time together is my sharing the tools, the steps needed to change, to improve or transform. I teach and share what to practice and how to practice. The swimmers job is to go home to practice! The greater challenge is being okay with not knowing how long it will take. It requires a paradigm shift. Instead of the typical doing more, trying harder, and making it happen, it is just the opposite- letting go. That surprisingly is huge! and much harder to do. Stop muscling, fighting, forcing, powering. Less is more. Instead of only thinking your way, feeling and softening is the key. This may require practice letting go-doing less, feeling more, do not try so hard. Your effortless swimming takes more effort to do less… I know, but it does. Do practice the drills and the skills. Let it feel awkward, be okay with awkward as you “pass through the middle place.” Put the required effort into it and it will change. 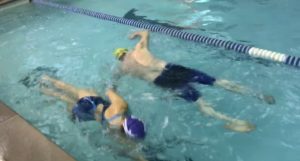 On your way to effortless swimming you will need to put forth some effort. Settle in, no time expectation, stay curious. Embrace it.